So, I had the opportunity to try my hand at making these cupcakes again. For the first time ever, I was asked to make cupcakes for a coworker's dinner party. I could not have been more excited! True I bake a lot but, normally it is because I am in the mood or because someone in my office is having a birthday. But this time, these were requested and I wanted to improve on the ones I made two weeks ago. I wanted lighter and fluffier cupcakes that were still moist and delicious. These turned out just the way I wanted! Butter and sugar creamed together, will not be completely smooth. Think about when you make a cake from a box, this batter may have lumps. The cupcakes should bake until golden brown. I over course choose only the prettiest ones to give for the dinner party. Butter, sea salt and powdered sugar blended together. Scrape down the sides of the bowl and blend in the caramel and you have fluffy salted caramel frosting. Yum! 1. Preheat oven to 350 degrees F. Line cupcake pan with liners and spray with non-stick cooking spray. 4. Add in eggs one at a time to the butter-sugar mixture, mixing well between each addition. Then whisk in the vanilla. 5. Add dry ingredients and buttermilk to the wet ingredients, alternating between the dry ingredients and buttermilk, starting and ending with the dry ingredients. 6. Fill cupcake liners 1/2 full and place a flour coated caramel piece in the center of each cupcake. Then fill the cupcakes 1/4 more, till the liners are 3/4 full. 7. Bake 16-18 minutes or until a toothpick comes out clean. 1. In a saucepan, stir together granulated sugar and water. Bring to a boil over medium high heat. Cook without stirring until mixture turns a deep amber color. Remove from heat and slowly add in cream and vanilla, stirring until very smooth. Let caramel cool about 20 minutes, until it is just barely warm and still pourable. 2. With a hand mixer, beat softened butter and salt together until lightened and fluffy. Reduce speed to low and add powdered sugar. Mix until thoroughly combined. 3. Srape down the side of the bowl and add the caramel. Beat on medium high speed until light and airy, and completely mixed. Mixture should be ready to use without refrigeration. If your caramel was too hot when added, it will cause your icing to be runny. If this happens refrigerate for 15-20 minutes. Frost cupcakes once fully cooled. Do not stick these cupcakes in the refrigerator to store, simply store in an airtight container and room temp. 1. Using a double boiler over medium heat, melt the chocolate chips, stirring slowly and making sure not to burn. 2. Pour melted chocolate on to a jelly roll pan or any flat pan that is small enough to fit in the freezer but still a good size. Spread chocolate using a spatula, cover the pan until the chocolate layer is approximately 1 millimeter thick. Cover evenly with sea salt and place in freezer for between 25 minutes to an hour. 3. Remove from freezer and cut chocolate using a pizza cutter in desired shapes and sizes; place on top of frosted cupcakes. Enjoy! A pie for JL. Thanks for remembering the high five and I think I owed you one. I searched high and wide for a crumble apple pie recipe. This one sounded delicious and easy. I have to admit, I do not make my own pie crust. Store bought crust in the refrigerator section is flaky, delicious and just way too easy. I always ask for honest opinions, so I can take those and make a dish better next time. A response to this pie from a very good friend was that this pie is "everything I could want in a pie". I take no credit for its deliciousness, as all I did was follow the recipe. Enjoy! 5. Blend first 5 ingredients of topping in a food processor. Add chilled butter cubes; using on/off turns, cut in until mixture resembles wet sand. If you do not have a food processor, mix try ingredients and then cut in butter. 6. Toss filling to redistribute juices; transfer to crust, layering apples neatly in pan. Pack topping over and around apples. 7. Bake pie on baking sheet until topping is golden, about 40 minutes (cover top with foil if browning to quickly). 8. Reduce oven temperature to 350 degrees and bake until apples in center are tender when pierced and filling is bubbling thickly at edges, about 35-40 minutes longer. Cool until warm and serve. I had some baby carrots that we going to go bad, so I thought what better use for them than to grate them and throw them in some cookies. Plus, one of my all time favorite desserts is carrot cake. I don't think you could have paid me to ever try it as a little kid, carrots in dessert, carrots get dipped in ranch dressing not grated and mixed with flour and sugar. Anywho, these are like little carrot cake cookies. They turned out cakey, moist and pretty delicious. Believe it or not next time I might add another tablespoon of butter. Make sure to not over bake these as they can become too dry. So unlike most, I had January 3rd off. I had over ripened bananas and thought what better to do with my time than try a new banana bread recipe. Banana bread and muffins are my arch nemesis; they never turn out as good as I would like them to. This one came from Heirloom Baking with The Brass Sisters(thank you PC for this awesome cookbook) and all I did was add a touch of cinnamon along with the nutmeg it called for. It is my opinion that cinnamon and bananas baked together just work. They turned out better than most banana baked goods I make and I would definitely use this recipe again. My mom and I enjoyed one loaf as she was up this past weekend and hopefully the homeless man on the corner in DC enjoyed the other. My thought being homeless people need to eat. I enjoy baking, but should not eat all that I bake, so why not share. 1. Set the oven rack in the middle position. Preheat the oven to 350 degrees F. Spray one 9-inch by 5-inch by 3-inch loaf pan or two 8-inch by 4-inch by 2 1/2-inch loaf pans with non-stick cooking spray then coat with flour. 2. Sift together flour, baking soda, salt, nutmeg and cinnamon. 3. Cream butter, brown sugar and sugar with a whisk or hand mixer. Add the eggs and then bananas, mixing after each addition until thoroughly incorporated. Mix in sifted dry ingredients; be careful not to over mix. 4. Pour batter into loaf pan. Bake 50-55 minutes, or until toothpick inserted in center comes out clean. (If you choose to use two small loaf pans, bake between 35-40 minutes.) Cool on rack. Store covered 2-4 days in plastic wrap and then in a plastic bag or container. Delicious slightly warmed with butter. In my office we celebrate everyones birthday. They chose what they want, type of cake, dessert, etc. and I try my hand at it. This past fall at a meeting at The Montage in Laguna Beach a co-worker of mine had the most delicious cupcakes made for her, for her anniversary. 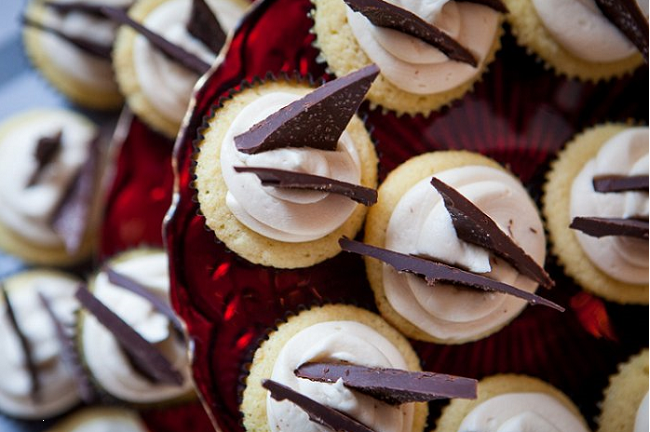 The cupcakes had this delicious chocolate twist on top, with crunch silver sprinkles, creamy, fluffy salted caramel frosting, delicious light and airy vanilla cupcakes with a sweet caramel candy treat inside. This was my attempt, my weak attempt. The frosting did turn out smooth and fluffy, but the cake was too moist and unfortunately the caramel inside did not fully melt. All the same there are parts I would do again and a few things I would change. Enjoy! I took your standard caramel candies and cut them in half and coated them with a little four so they would not sink to the bottom while baking. Next time I will cut them in quarters. Preparing the caramel for the salted caramel frosting. The longer you let it go, the darker your caramel will turn out, and ultimately the darker the frosting. Just don't let it burn. 2. Line cupcake tin with liners and spray with cooking spray. 3. Combine 1/2 cup melted butter and sour cream in a large bowl, stirring with a whisk until well blended. Add granulated sugar and 2 teaspoons vanilla, beat until well blended. Add egg substitute, beat until well blended. 4. Dry ingredients: Lightly spoon 2 cups flour into dry measuring cups, level with a knife. Combine 2 cups flour, baking soda and 1/2 teaspoon salt, stirring well with a whisk. Add flour mixture and buttermilk to wet ingredients, beginning and ending with flour mixture, so not over beat. Spoon a teaspoon full of batter into muffin tin. Place one half caramel in the center of each cake. Cover caramel with cake batter filling each liner 3/4 full. Bake at 350 degrees for 15-20 minutes; until toothpick inserted in the center of a cupcake comes out clean, just don't forget about the melted caramel in the center. Cool the cupcakes for 5 minutes and remove from tin to cooling rack. 1. In a saucepan, stir together granulated sugar and water. Bring to a boil over medium high heat. Cook without stirring until mixture turns a deep amber color. Remove from heat and slowly add in cream and vanilla, stirring until very smooth. Let caramel cool for about 20 minutes, until it is just barely warm and still pourable. 3. Scrape down the side of the bowl and add the caramel. Beat on medium high speed until light and airy, and completely mixed. Mixture should be ready to use without refrigeration. If your caramel was too hot when added, it will cause your icing to be runny. If this happens refrigerate for 15-20 minutes. Frost cupcakes once fully cooled. Do not stick these cupcakes in the refrigerator to store, simply store in an airtight container and room temp.